_ _I absolutely love to cook. And more than that, I love to cook for other people. Throughout my last semester of college I had a professor that brought us snacks… every single day. She’s the sweetest lady (and completely out of her mind) and this gave me an excuse to use her and the rest of my classmates as my guinea pigs for previously untested recipes. They were always met with general endorsement, but they were usually your average crowd-pleasers: chocolate chip cookies, pumpkin muffins etc… But on the last day of class we had a potluck, and I decided to go out on a limb with these lemon-thyme mini muffins. _ _As soon as I got to the classroom however, my crippling need for approval from others kicked in and I self-consciously shuffled to the far end of the table and nestled my plate discreetly between two others; then I lurked in a dark corner, anxiously watching people’s faces as they tried my culinary work. _ _One kid in particular caught my attention as he tried one… then two… “Oh my god!” He scooched the dish closer to him, “I hate these!” A couple inches closer, “no one else should even try these!” …He then proceeded to dump the rest onto his paper plate. He really hated them. And so do I. Hate as in love… Obsessed. 1. Line your pan with cupcake papers or grease and flour. 2. Mix the sugar and lemon zest until thoroughly combined. Add the eggs one at a time then slowly add the milk and olive oil as you mix. Beat the batter until everything is blended, but be careful not to over-blend– you want the muffins to rise without being too puffy. 3. 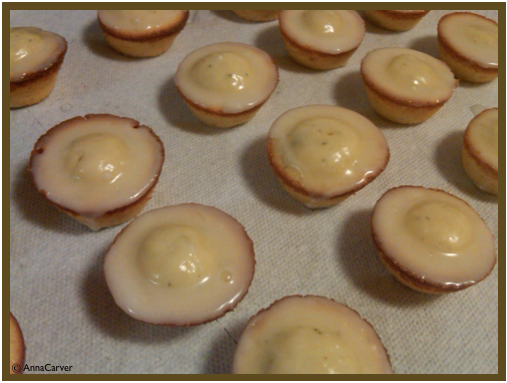 Whisk in the rest of the dry ingredients and pour into the muffin tin (about 2/3-3/4 full). 4. Bake about 25 minutes or until the muffins spring back when touched. 5. While the muffins cool on a rack, make the glaze by combining the powdered sugar and the lemon juice and then slowly mixing in the half-and-half. It’s easy to make it too runny so you may not need all 3 tablespoons. You can either drizzle it over the tops of the muffins, or as I like to do, dip them in the glaze and let it drip down the sides.